As I drove home from work in yesterday afternoon's downpour my negative thoughts turned to parkrun, and a potential wash-out! But, I needn't have worried as the sun shone and the trees stood fairly still and glorious running weather was in place to greet our 285 runners, joggers and walkers. This is the ninth biggest field, bolstered by graduates from the Banbridge Couch-to-5K and visitors from Wallace which didn't run today. We were a bit light on volunteers this morning and are incredibly thankful for those who stood in at short notice. Please don't leave us in the situation where we have to pull runners from the start-line just to allow parkrun to happen. If everyone could volunteer 3-4 times per year we should avoid these panics. Leave your name on the board at the scanning table, drop us an email or get in touch via Facebook. 36 first time runners to the lakes, the majority who are completely new to the parkrun family. Whether you came to parkrun from another event, through the Banbridge C25K or through your own dedication, please come again next Saturday and make parkrun a weekly habit. 43 PB runs this morning, with many others also coming close. More Saturdays like today and I'm sure more records will fall. A sixth time as first finisher for Niall who also recorded a PB! Emma finishes as fastest lady for an amazing 19th time. Ken tops the age-graded standing once again. Across the finish line to be greeted by a graduation party, once again brilliantly organised by party-planner Gillian. We hope you all enjoyed your treats and thanks to those who brought along treats and drinks. I can't wait for the next one so I can get some more banana bread! We're slap bang in the middle of the racing season. 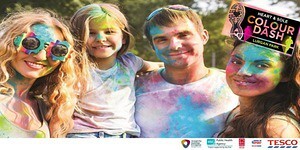 Tomorrow sees Lurgan Park host a colour run and/or the Clarke's 5k in Dungannon. 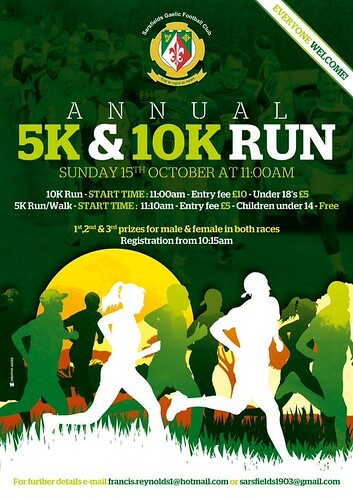 Next Saturday Kernan Run Club are organising the Scarvagh House 5k/10k in aid of Guide Dogs (I'm hoping there's time to get it done after parkrun!). On the 26th May there's the Gosford Forest Run. 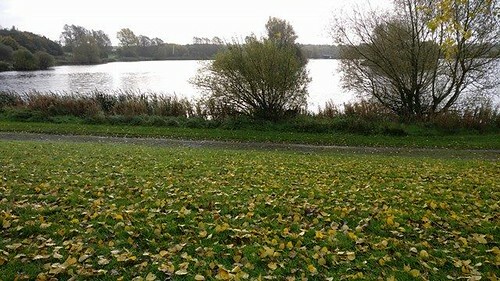 Sunday 27th May at 11AM there's a Superhero run in Lurgan Park (bring your cape) and finally, on 6th June the Craigavon Lakes 5k/10k takes place. Keep an eye out on Athletics NI for more events, and don't be afraid to give something different a try. Rain? It never rains on parkrun and sure enough our 188 runners, joggers and walkers remained dry as they lapped City Park. 15 minutes either way and we'd all have been drenched no doubt! Still, plenty of autumnal leaves about, so that's something to be wary of slipping on in the weeks ahead. Today's full results and a complete event history can be found on the Citypark parkrun, Craigavon Results Page. Today we had "club support" with ten members of Kernan Run Club providing the bulk of our volunteers. It really was great to have a full complement of marshals available on the course, making sure we were all kept safe and didn't get lost - thanks KRC! We do need a similar number of volunteers every week. If you can help out as an individual or by persuading a group of friends/colleagues/club mates please get in touch through Facebook, email or by leaving your name at the scanning table. The Farm welcomed eighteen first timers this morning, though nine of them were veterans of other events. We hope you all enjoyed your morning at City Park parkrun. Another good running morning aided 34 to a PB. I'll pick out of these two runners for special attention. Darren Little celebrates his 150th run with his recent steady improvements. Amy McNickle recorded a fourth consecutive PB and a sixth in her last seven runs. Well done to each and every one of you, you are permitted to have a bun! Colin MCDOWELL (VM45-49) (Unattached) was first over the line in 19:19 - third time in 72 appearances. Niall RANKIN (VM40-44) of Roxy Runners, was second (third overall) over the line in 19:35 - has been first to finish on 4 previous occasions. Sam FOSTER (JM15-17) (Unattached) was third (4th overall) over the line in 19:49. Well done all three of you, particularly to Sam who out-sprinted me to the line! Eimear NICHOLL (SW30-34) of St Peters GAC, was first (second overall) over the line in 19:26 - 5th time in 14 appearances. Colleen MCCONVILLE (SW30-34) (Unattached) was second (6th overall) over the line in 19:52. Gillian MCCRORY (VW35-39) (Unattached) was third (19th overall) over the line in 21:29 - has been first to finish on 14 previous occasions. Eimear continues her recent run of fantastic form and no doubt will soon crack the 19 minute barrier and/or take an overall first place. Colleen, visiting us from Tooting, challenged towards the front for the whole run and Gillian relaxed to another podium place. Eimear NICHOLL (SW30-34) – 76.16% for the time 19:26 (second overall). Colin MCDOWELL (VM45-49) – 75.15% for the time 19:19 (first overall). Clinton DRAKE (JM10) – 75.00% for the time 23:44 (45th overall). The male record is held by Connor MAGILL who recorded a time of 15:48 on 17th November 2012 (event number 15). The female record is held by Rebecca HENDERSON who recorded a time of 18:23 on 23rd May 2015 (event number 144). The Age Grade course record is held by Terry EAKIN who recorded 87.71% (19:07) on 4th April 2015 (event number 137). Citypark parkrun, Craigavon started on 11th August 2012. Since then 5,108 participants have completed 35,799 parkruns covering a total distance of 178,995 km, including 7,289 new Personal Bests. The autumn race season is in full flow, with two local events happening tomorrow. 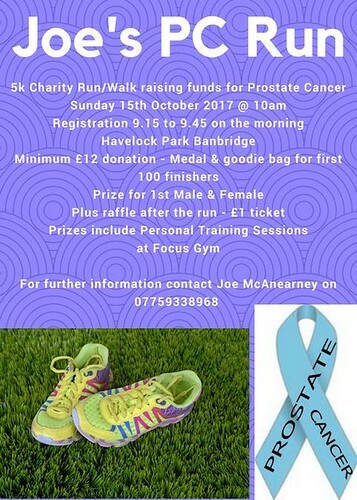 At 10am at Havelock Park in Banbridge is Joe's PC 5k Run and at 11am Sarsfield GFC are hosting their annual 5k and 10k. I wouldn't recommend the driving that would enable you to do both so choose carefully. Thanks also to everyone who bought a raffle ticket in aid of Prostate Cancer, over £100 was raised this morning alone. There are landmark t-shirts available to order, but in limited sizes, so if you are due one please check for the link on your results email. The Tribe Sports sponsorship is now winding down and a new way of ordering shirts will be available in the coming months that will hopefully leave you all looking as lovely as our models below. 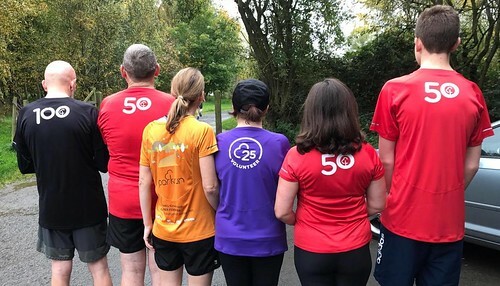 The black, red and purple shirts have to be earned, but the apricot top can be purchased in vest, t-shirt, long-sleeve or jacket form, with profits going towards keeping parkrun going and free to all. Finally, lost property (sort of). We had a fluorescent yellow rain jacket left behind with someone lifting a similar jacket instead. Nuala has one and will bring it along next week, who has the other? What a morning we all had at Tannaghmore Farm yesterday, all 340 of us (plus volunteers). For the most part it was a lovely summer morning, with just a slight shower early on to cool off those on their hot laps. 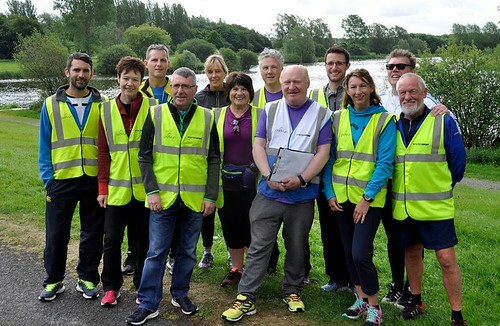 In any case, the bright smiles of our Waringstown C25K graduates and members of the new parkwalk scheme meant there wasn't much to dampen the overall enthusiasm! However you came to join us at City Park parkrun we hope you enjoyed the experience and join us every Saturday from now on. We had a great showing of helpers yesterday who helped the whole event go off without any (major) hitches. Remember, we do need volunteers every week and it would be great if every runner could look to do so at least three times a year. Also, if you happen to see someone with a hi-viz vest on out on the course, give them a smile, a wave and a gasped "thanks"! An amazing 86 first timers this morning (that we know of). I hope you all enjoyed the experience! A bit of a head wind out on the course, so fair play to our 69 PBers. Ed leads home the field for a seventh time. 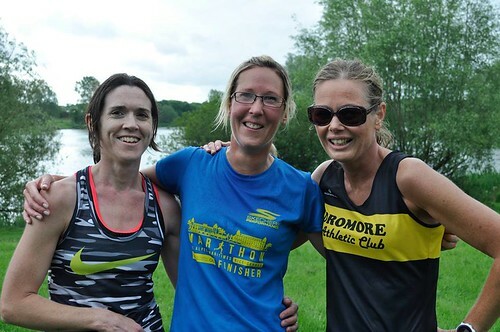 Susan brings her recent good race form to parkrun. A bit of shuffling of the podiums in the age standings. Sam and Patricia will be hard to catch at the top of the points standings, but it's all tightening up in the race for the other podium spots! So many reasons to celebrate yesterday morning, so when we were all scanned in there was cake available to those unable to resist such temptations. Once again well done to all our runners, walkers and volunteers, no matter how you got to where you are. You should all be incredibly proud! We had some parkrunning landmarks too. 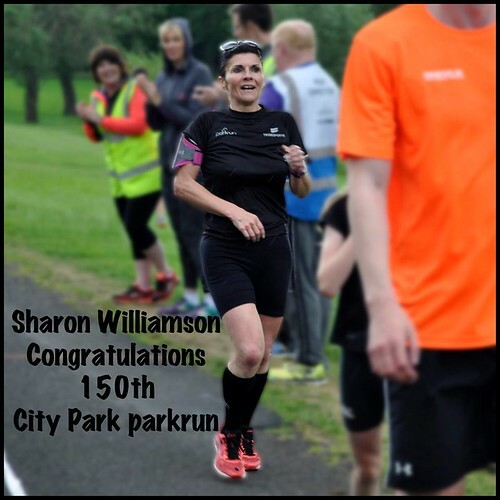 Sharon Williamson ran her 150th parkrun, though there's no t-shirt for that. Kieran Robinson gets a black t-shirt after his 100th run, David Quinn a red t-shirt after his 50th run and young Dale Mulligan a white t-shirt after his tenth run. Welcome to the "Clubs"
We are now well into race season and we've had athletes off recording amazing times all over the place in the last week or so. Today was the Walled City Marathon (and also the Grand Fondo for the bikers) so I hope everyone had a great day taking part in those. Two upcoming 10ks I'd like to point you towards. Next Wednesday (7th June) will see our "home" race as the Lakes 1k/5k/10k starts off at the Watersports Centre. On 15th June is the Keep Er Lit 10k in Coalisland which I'm assured will be very flat. Please consider giving something different a go over the next while, there's a wealth of choice on the NI Athletics website. Finally, if you have any issues with missing/incorrect times from yesterday, please get in touch with approximate finish position, times and your barcode number and we'll try to fix as soon as possible. Our 187 runners and ten additional volunteers were greeted with chilly conditions at the Lakes this morning [the more people talk about Christmas the quicker it starts to get cold is my theory, so don't mention it for another month]. Still, the conditions were still and ideal for a bit of a push should your body have been willing. As you hopefully notice above there is an update on our impending move to Tannaghmore Farm, the 3rd December is the expected date. If this changes it will be well publicised and it is my intention that a message such as the one above will remain prominent on the City Park news page and Facebook until a few weeks after the move has happened. The run route will essentially be the same as our current one with just a few tweaks to ensure it remains 5 km long. If you're at a loose end in the weeks ahead you may want to familiarise yourself with where the farm is and a map is linked above. As always we thank our volunteers, some of who regretted not bringing along their gloves this morning! 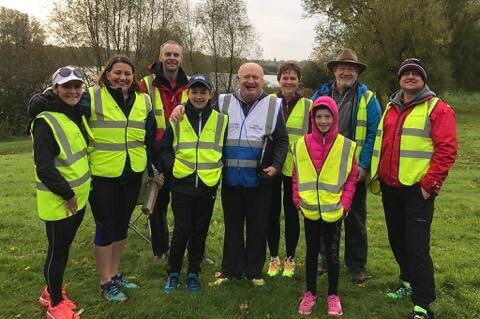 We do need helpers every week, but with particular reference to our forthcoming move we'll need a few extra marshals on the course to make sure nobody gets lost. If you can help please leave your name at the scanning table or get in touch by email or Facebook. We welcomed 14 first time visitors to City Park parkrun this morning, six of which were completed their first effort event. Particular kudos to Brendy, our fastest newbie, who can go into work on Monday with his head held high! The cool still conditions (though the wind did pick up a bit later) no doubt aided out 28 PBers this morning. Well done all, go get yourselves a well deserved treat! A first ever first place finish for Evan, who missed out on a PB by just two seconds. David and Niall are no strangers to the upper echelons. Three familiar faces among the top girls with Roslyn finishing as top lady for an amazing 19th time. The top finishing girls and boys are shuffled a bit in the age graded standings. "Young Sam" has extended his lead slightly over "Old Sam" at the top [apologies to either of you two for any offence!]. "Young Julie" also extends her lead as the top lady. I hope you all got a flyer for our forthcoming evening get together which will take place at Brownlow Community Hub on Saturday 19th November from 6:00 pm - 7:30 pm. 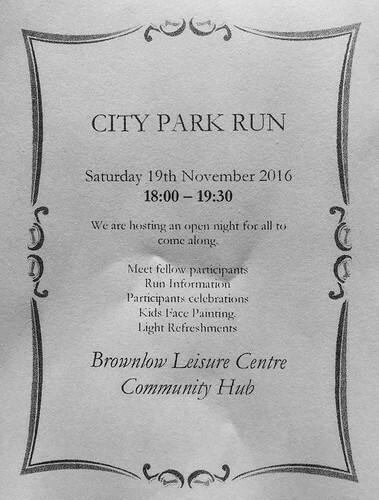 Please come along and share a bit of fun with your fellow parkrunners. If you're reading this and you are involved with a running/fitness club or group and would like to come along to recruit new members let us know and we'll save you some space. Congratulations to our newest club members, Colin Ferris completed his 50th run this morning and young Marc Comiskey his 10th. You are now both entitled to new t-shirts so keep an eye out for the e-mail. Last weekend there was a huge contingent of City Parkers down in Dublin for the marathon, truly you could barely turn around in the city without bumping into someone you knew! It was great to see so many friendly familiar faces, and thanks once again to those who came to my aid at the end when I'd taken a bit too much out of myself [if at any point in the near future you see me curled up with a blue blanket, there is a related story]. There are many races on this weekend, though I'll admit to having lost track completely as I've been knackered by my own efforts. Needless to say, good luck and/or well done to anyone who has/will run in Lurgan, Belfast, Ballyclare or wherever else! Finally, you may notice that the Water Sports Centre is looking a bit sparse. The old place is in its final days and I believe we are the only remaining group of regular users. As such, thanks again to the council staff for coming along to open up so we can get a bit of shelter and to use the facilities. It would help the council no end if we could clear up and clear out as quickly as possible in the weeks ahead so the staff can get away and on to their other roles promptly. Even grey days at City Park parkrun can be glorious! Today we saw the latest Couch-to-5k graduation with new runners from Banbridge, Lurgan and Portadown swelling our numbers to 329 this morning. Congratulations all of you, and I really hope to see you back at the Lakes in the weeks, months and years ahead - we're there every Saturday at 9:30. 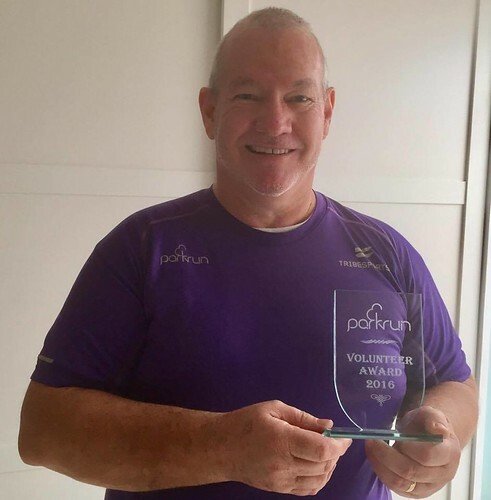 Before we got started there was a belated award to Ron Gemmell who was "Volunteer of the Year" but missed the anniversary parkrun (and the last month) due to living the life of Riley! Well done Ron, parkrun would not be the same without you! There was a great showing of volunteers this morning to help us deal with the extra numbers. We are incredibly grateful to each of you. Remember, we need people to time, scan and marshal on a weekly basis, so if you haven't volunteered lately please get in touch via Facebook or the volunteers page. 128 first timers this morning, mostly made up of C25K graduates, though eight are veterans of other parkrun events. 45 PBers this morning, not slowed a bit by the nasty headwind in the last km. Well done all, hopefully you took advantage of the handy on-hand treats. A third time as first finisher for David, with Colin on the podium for an eighth time and Barry taking it easy to finish third. A fourth time as top lady for Fiona. Nadia returns after a year to make the podium for the second time and Louise is a regular podiumer too. The age graded standings are exactly the same as the overall top three! Ken holds a healthy lead at the top as he volunteered today while injured. Fiona edges slightly further ahead of Judith at the top. The C25K graduation party was relocated to the gazebo behind the Water Sports Centre due to the inclement weather. I hope you all made it in for a wee treat. 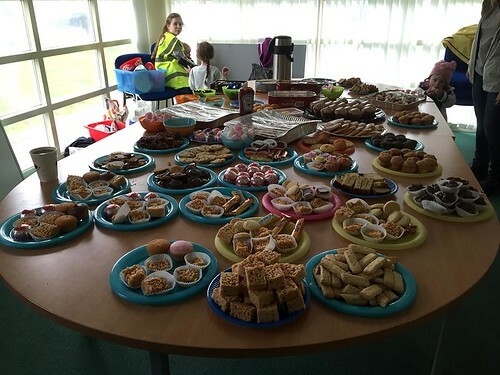 Thanks to everyone who brought along buns, biscuits, sweets and drinks and to those who helped out in any way. There are plenty of photos courtesy of Michelle (again) on the Facebook page. Have a look. Well done to any of our many regulars who were off running elsewhere this morning at the Bangor 10k or the Causeway 10k/half-marathon/marathon. Haven't heard any direct reports yet, but hopefully the weather wasn't too bad! 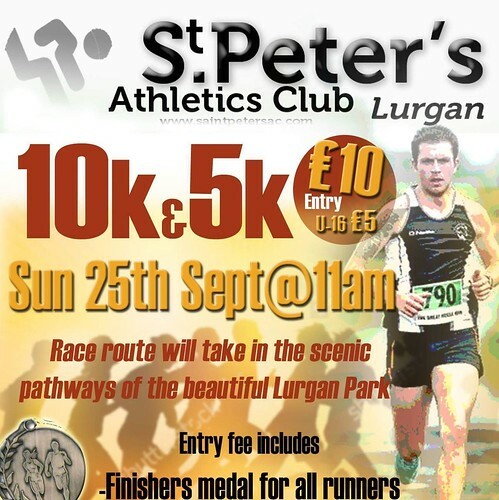 Tomorrow sees St Peter's AC host a 5k & 10k at Lurgan Park. Many of our runners were saving themselves for this and going easy today, so I expect some stunning times! Registration from 9:00 am at the cricket pavilion and costs £10, with the race to start at 11:00 am. Goodie bags and medals for all runners. Finally, thank you to everyone who parked at the Civic Centre this morning. Could I ask that you all continue to do so for the next month(ish) before we relocate to Tannaghmore Gardens. It makes City Park safer for everyone, both parkrunners and "normal" people and keeps us on good terms with the council who we will be particularly relying on to support us during the building of the new leisure centre. Today we had a full quota of volunteers who fulfilled their roles and dealt with any mishaps with style and grace. Brendan remains on an active recruitment drive for the weeks ahead as holidays will be taking their toll on some of the regulars. Please look to fill in the sheet at the scanning table or get in touch via the volunteer page or Facebook. If we all pull our weight our event will continue to run smoothly. Nineteen first time visitors to the lakes today, though four are veterans of other parkrun events. I hope you all had a great experience at City Park. 47 PBs today, great running all. I'm sure you'll all be back to push your limits even further in the weeks ahead. Second time visitor Scott Kennedy romped home in first place, with a PB to boot. Jillian finishes as top lady for an eighth time. The top two are reversed as Ken equals his PB and improves his age-grade ranking. Very little happening in the top tens and all is pretty much sorted for the medal positions. As I mentioned earlier, this was indeed a day for landmarks. Young Rory Burns joined the 10-Club; Brenda Brown and Dale McCrory both completed their 50th runs and have earned their red shirts. 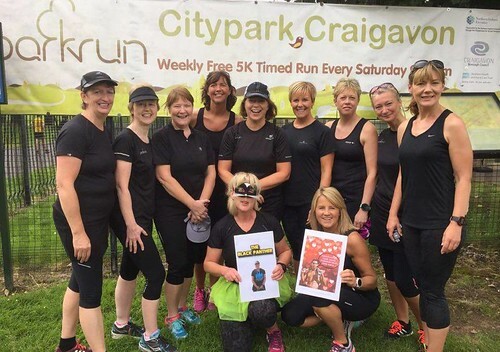 Julie Doran (aka the Black Panther) completed her 100th run and her fellow run-chatters made the occasion more special as they all dressed in black for the day and completed the course as a group and followed it up with picnic and cake. I was honoured that the girls included me in the celebrations as I completed my 150th parkrun today and presented me with three 50 badges and invited me for cake which was a nice gesture as I still have another hundred runs to claim my next shirt. Also, given the number of people who asked if it was my fiftieth birthday, it seems I should start a new moisturising regime! Good luck to our regulars who will off racing in Cookstown or Mullaghbawn tomorrow. Many were taking it easy round the Lakes today, though that is of course a relative term! I hope the weather is kind and you all reach your goals. If you're interested in completing a different running challenge, please check out Athletics NI or if you fancy something a bit hillier, NIMRA. It was pointed out to me that people are looking forward to cross country season already, but to me that would involve considering that winter is coming! For our younger runners (aged 4-17), please consider looking into the parkrun youth panel, which will help shape parkrun for the years ahead. It could be a worthwhile project for the school holidays. On 13th August we'll be celebrating City Park parkrun's 4th birthday with another party. To help this go smoothly we'll need donations of food, drinks and money to pay for prizes and presents. If you could drop a few pounds into the box at the scanning table it would be greatly appreciated. In addition to the photos above kindly supplied by Ron, there is an excellent slideshow on the Facebook page which was created by Michelle Mowlds. Finally, another reminder about parking. The access road was once again partially blocked by cars. It is vital for all park users that there is easy access for the emergency services. There are plenty of additional parking spots available at the Civic Centre which is just a short walk away. We don't have enough volunteers available to redirect traffic on a weekly basis, so please use the other car park as a default. It was a quiet enough morning at the Lakes this morning, aside from the record breaking 478 parkrunners, smashing our previous best of 309. Numbers were swelled by the latest C25K graduates from Banbridge, Lurgan and Portadown and frankly I was awe-struck by the sight of the mass of blue t-shirts! Well done to all, I hope you can use parkrun to build on the work you've carried out over the past few months. Anyone with family or friends interested in taking to running should keep an eye out for the next C25K intake which should be starting soon. A great turn-out of helpers this morning and they all played a vital role in helping the event pass off smoothly despite the additional numbers. Particular kudos to Gillian for sorting the party (and indeed thanks to all who brought along treats) and to John for his handy-crafts in getting additional finish tokens made in double-quick time. It was also great to see so many marshals dotted around the course cheering everyone on. We do need volunteers every week, so please let us if/when you can help out by the usual means. An amazing 243 first timers today, 236 running their first ever parkrun! C25Ker or not, I hope you all felt welcome and will come back and join us again soon. Great weather for running saw 55 PB performances this morning. Well done all. A sixth time as first finisher for Paul, a fifth time on the podium for Mark and an "unknown" in third [aka Barry Shanks]. Third time as top lady for Natalie. Jillian with her usual podium performance and PBer Tracy taking third spot. Another PB sees Ken top the age graded standings once again, followed closely by training buddy, Mario also with a PB. Not much happening in the males points standings again apart from Stuart re-entering the top ten. Gil drops a few spots after today as she was volunteering and has already maxed-out her volunteering points. This has allowed Sharon to jump into the top three. Back to the Water Sport Centre for buns and chat. Thanks once again to everyone who brought stuff along, it looked fantastic, though I actually resisted indulging! 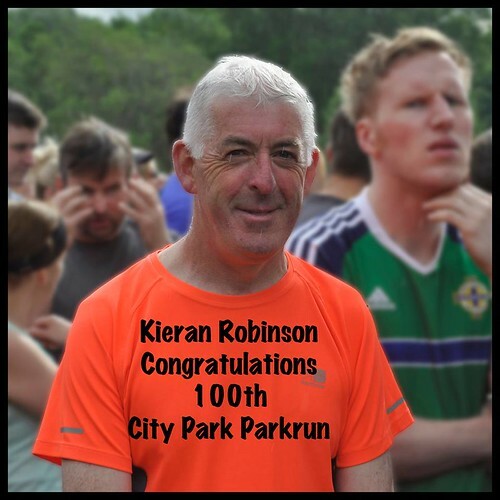 Congratulations to Stephen Furphy who completed his 100th run this morning, to Jimmy McFadden who ran for the 50th time and to junior Thomas Girvan who has earned his 10 Club shirt. Good luck to anyone who will be running in the Clan na Gael 10k/5k tomorrow at the Lakes. Starts at noon and entries on the day. 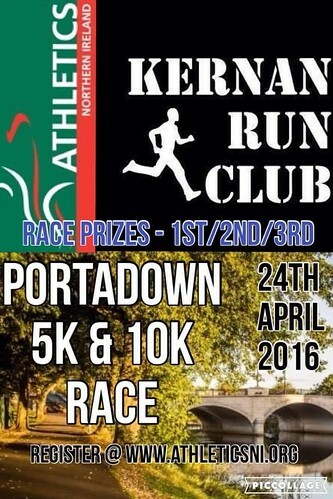 There were also fliers for the upcoming Kernan RC Portadown 5k/10k at the People's Park on 24th April so keep that date free too if you can. Loads of photos of today's event can be found on the Facebook page courtesy of Declan, Michelle, Ron and Gil (a selection are also featured above) - thanks guys. We're still looking for donations for the new speaker system, so if you could spare a few pounds, please leave them in the box at the scanning table. Hectic day all round, so if I've missed out anything important, leave a message on the Facebook page and I'll get it added. As I dandered towards the Water Sports Centre from the Civic Centre carpark (still plenty of spaces there by the way!) this morning I could sense something was wrong. Why had nobody put out the cones for the finish tunnel for a start? As I came round the corner I was quickly asked, "is it going ahead this morning?" by reflex I said "yes [long pause] I think so." I noticed the locked Centre gates and doors and lots of people with pained 'I need to pee' faces. Brendan, Sheelin and John were focussed and confident that we could get started, just a wee bit edgy whether there'd be tokens available come the finishing line! Brendan relayed the tricky situation with aplomb from his new speaker system (he doesn't know any Madonna songs though). The new speaker has become necessary as the old one became ever more temperamental and Brendan's pre-run briefings were only being heard by a handful of people. It is important to listen to the briefings. First timers need to know the way and experienced runners need to be made aware of any potential obstructions on the course. The speaker however will need to be paid for, so if you could drop an extra few pounds into the donations box at the scanning table it would be greatly appreciated and will ensure that none of our volunteers are personally out of pocket. With the brief completed we made our way to starting line with only a slight nervousness that this parkrun would 'count'. My other worry was that by this point my hands were freezing, and I'm sure there were plenty of others who had missed the pre-run warmth and facilities of the Water Sports Centre! Thanks as always to our wonderful volunteers who operated seamlessly despite the extra pressure this morning. Remember, your parkrun needs you! Please volunteer at least three times through 2016 to help keep the whole shebang going. Drop us a line through Facebook, email or by popping your name on the wee sheet at the scanning table. Panics are rare! This is also a good place to wish a speedy recovery to one of our stalwart volunteers, Ron following an operation on his knee this week. Thirteen lucky first time finishers at the Lakes this morning, eight of whom are completely new to the parkrun experience. I hope you all enjoyed yourselves and will come back and join us again soon! Twenty-three runners took advantage of this morning's great running conditions (was there any wind?) or maybe they were just desperate to get back and use the facilities! Well done to Nigel on coming home first on his first official parkrun (no need to ask how he knew the way!). Conor's a familiar face on the podium in second and Patrick in third was undertaking a bit of parkrun tourism and visiting the Lakes for the first time. Not much between our top two ladies, with first time visitor Mari pipping regular podiumer Kathleen. In third we have yet another first timer, Megan. Well done all! Nigel also tops the age-graded standings (with the course's third best percentage ever) while Ken once again takes his traditional place on the "old man's" podium with yet another PB. Recent parkrun recruit Mario also recorded a PB to come in third. Not a single bit of movement in the men's points standing, with Ken just slightly increasing his lead over Jonny. Julie (who formally introduced herself to me this morning!) still leads the ladies. The only movement was lower down were Fiona drops a few spots as she was away running elsewhere. So, back to the now thankfully opened Water Sports Centre for blessed relief and scan in! I hope anyone who was off running round Castlewellan or Stormont this morning had good races. Good luck to anyone competing in the Lurgan Park or Resolution Runs tomorrow. There are plenty of running events coming up in the weeks ahead (for instance, I've just remembered I'll be in Carlingford next Saturday for the half marathon!) Check out the Athletics NI website for more info. In two weeks the latest C25K graduation run will be descending on City Park. As such, we could use some extra volunteers plus a few buns for the after-party. Gil will be putting up a more detailed request next week. Particularly with the added C25K crowd in mind, please make use of the parking at the Civic Centre as it will be even more vital not to block the access road to the Lakes should the emergency services be required. It's just a short extra warm-up walk. Started well, but ran out of puff... now am I talking about running or rugby? These days we've no idea what sort of weather will face us on a parkrun-day morning - rain, ice, snow and tropical storms are all a possibility! Today we had overcast and relatively mild, so reasonable enough I suppose. This is Valentine's weekend, so Gil fulfilled her usual duties of sorting the heart-shaped sweet treats. She also awarded me with some chocolate snowmen following our recent competition which have been (nearly all) greatly appreciated this afternoon. Valentine's Day is about love, and what we all have in common is loving parkrun. This was nicely illustrated by a Facebook post during the week asking people what they love most about their City Park Saturdays. Adele loves the social side, making friends and the "runchats" (or grunts). 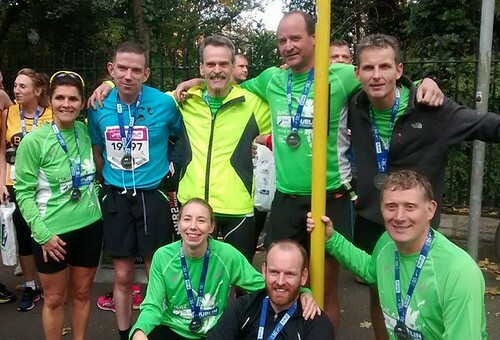 Paul loves getting advice from experienced runners and the joy of our C25K graduation events. 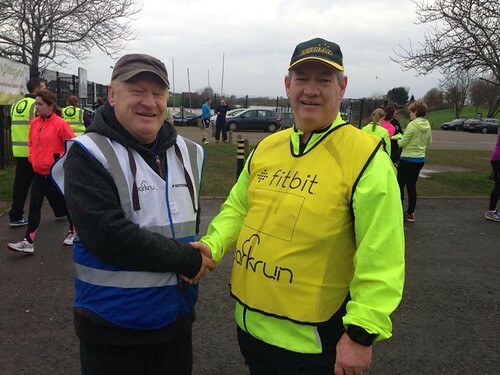 Mark loves getting his free Saturday's off to a great start and Jonny loves that he can turn up at any parkrun in Northern Ireland and be welcomed warmly. We'd like to hear your reasons to love parkrun on Facebook too. 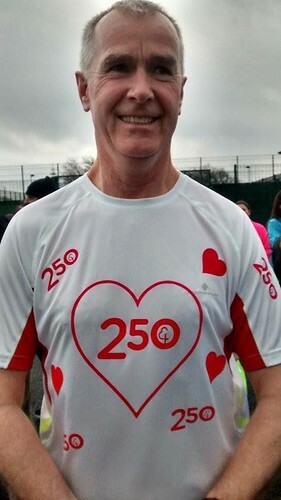 This morning saw a momentous landmark for parkrun in Northern Ireland as "parkrun Jim" Clinton became the first Irish person to enter parkrun's 250 Club. 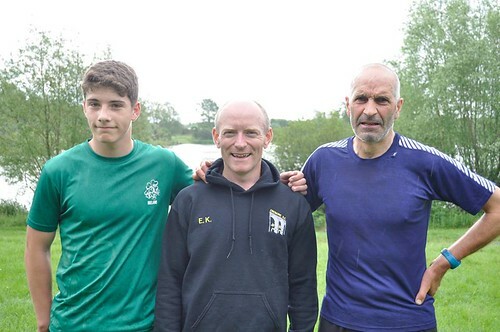 Jim's is an inspiring and impressive story and he's taken in a total of thirteen parkrun venues over the past five-odd years (but he's yet to sample the Lakes!). Well done Jim from all at City Park. Many thanks to this morning's volunteers who all did a great job. There are many familiar names on the list below, so a bit of fresh blood would be appreciated. Please look to volunteer at least three times through 2016. It isn't that taxing, but it is vital. Leave your name at the scanning table (look for the groovy new pen & holder) or get in touch via Facebook or email. Even better, if you could volunteer as early as possible, it would take the pressure off Brendan before Saturday mornings. We had 19 first time visitors to the Lakes this morning - how come that many never put their hands up when Brendan asks at the start? Anyway, I hope you all felt welcome and will come back and join us soon, whether you were one of the ten veterans of other events or a complete newbie. 25 PBers today, on what was a nice running morning, well done all! PBs from each of our top three men who look to have been well bunched together at the front. I believe we had a lady finish sixth overall, but as she hasn't scanned in, this is our official top three with two familiar faces and a first timer. Ken once again tops the age-graded standings and is joined by Wes and Mark, our top two overall finishers. No movement at all in the men's points standings, Ken well out in front. Not much movement in the ladies' standings either, but Fiona is back in the big leagues again. 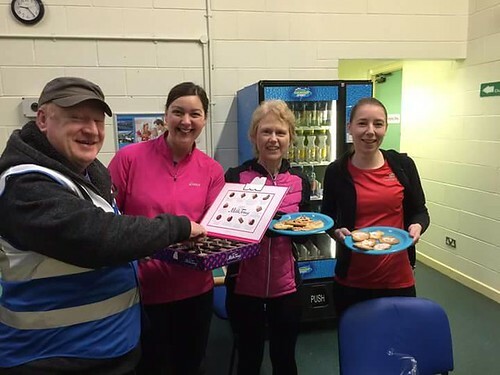 Back to the Water Sports Centre for some heart-shaped short cake and sweets - yummy - and a chance to acknowledge one of our own landmark makers on Ron Gemmell's "50/50 Day". That's fifty runs and fifty volunteerings, today as tail-runner, for Ron who has been a stalwart member of the parkrun team over recent years despite his injury problems. His enthusiasm is obvious, no matter what role he has fulfilled. 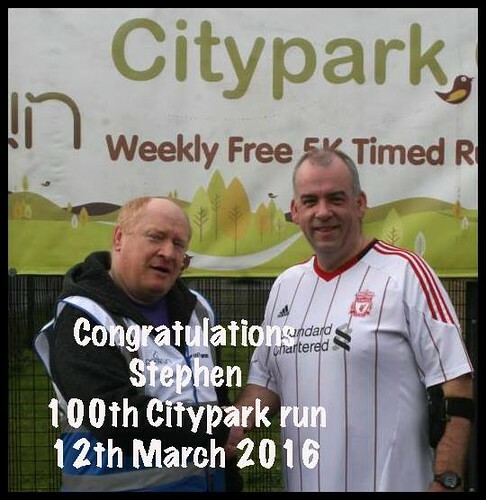 Next week should see us welcome our latest 100-Clubber, with Jonny Peden completing his 99th run this morning. Happy birthday to Alan Wilson for the week ahead. He turned the usual gift giving idea on its head by presenting parkrun with a set of running head phones to be awarded to today's 57th finisher. While I was close (62nd), the award went to Francis Reynolds who allowed (ahem) Joanne McCauley past him at the final corner to claim his prize. There are many many races coming up in the next few weeks, three of which were well plugged in last week's run report. Briefly, these runs are the Resolution Run at Queen's Sports in Belfast (the Dub), the Lurgan Park 5k/10k (both on Sunday 28th February) and Kernan Run Club's 5k/10k at Portadown People's Park on 24th April (which is also the day of the London Marathon). Also coming up is the Heart & Sole Colour Dash in Lurgan Park on Sunday 17th April which is being organised by the Council. Finally, back to our old favourite topic - parking. The carpark will be under further pressure from next week on with the Trail Demons taking over. As always, we have access to the carpark at the Civic Centre and the gateman assured me that someone will be there, and won't be locking anyone in if they get back to their car at 11:07 as I did this morning. So, please make use of the carpark, it will help keep all park users safe and the council staff happy. There were about five of us standing around during the pre-run briefing, eyeing each other up, to see who would lose the jacket first. Not sure who it was, but when one went to dump a layer, we all went - peer pressure alive and well among the men of parkrun! At least the rain eased off and the puddles were mostly avoidable, but the wind was harsh at all the usual places. Results appear to be a bit off again, I think the placings are ok, but the times are faster than they should be - is there anybody too upset at that? I'll not add too many times in below for the minute in case the glitch gets fixed . This morning we had a number of runners remembering the husband of a member of Jog Moira, Don Heaney, who sadly passed away a number of weeks ago. It was great to see so many remember a man who was clearly loved by wearing a tribute to him on their tops. 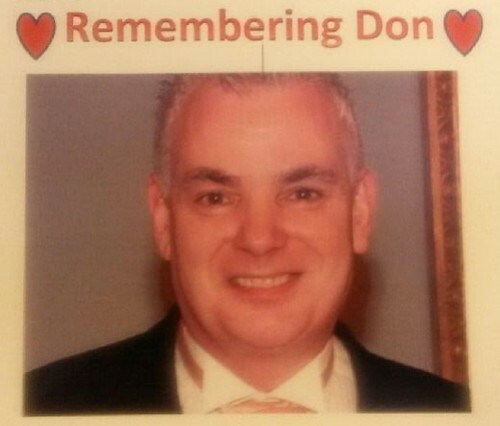 I'd also like to take this opportunity to pass on my sympathies to Don's family and friends. On what wasn't such a pleasant morning weather-wise, I reckon those of us keeping ourselves warm by running were in a better place than those standing around the finish line. I believe there were a few numb thumbs! We can always use more willing volunteers so please get in touch via Facebook, the volunteers page or by leaving your name at the scanning table. A healthy 16 City Park newbies, split equally between experienced parkrun visitors and those joining the global family for the first time. Well done all. Not sure what to say here. Officially there were 30 PBs, but I know at least a few of them are inaccurate. Still, if you know you PB'd, get your treat, be honest though! First timers in places one and two, well done both, but who directed who? Gil continues her stunning run of form, finishing as top lady for the ninth time, and fourth time in a row. Fairly sure this is the actual top three for the age-graded standings, though the order may mixed up. A couple of regular faces and new-boy Camron. Fairly static in the men's standings, with Sam sneaking ahead of Francis thanks to another strong finishing place. Static at the top of the ladies' table, but a few absences see lots of shuffling lower down - the margins are tiny! I hope any of our regulars who were off competing at the Seeley Cup 10k had a great race. It is one of the biggest events on the Northern Ireland Athletics calendar and was over-subscribed this year so just getting a place was an achievement. 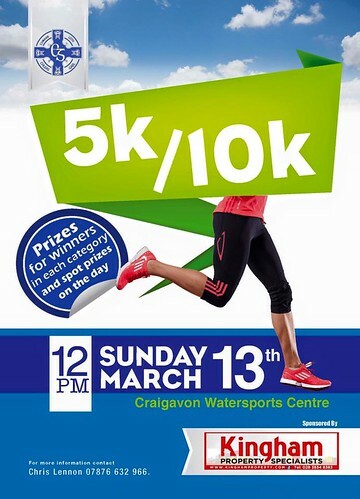 Next Saturday we'll losing a few more runners to the Loughgall 10k, which should be another great race. 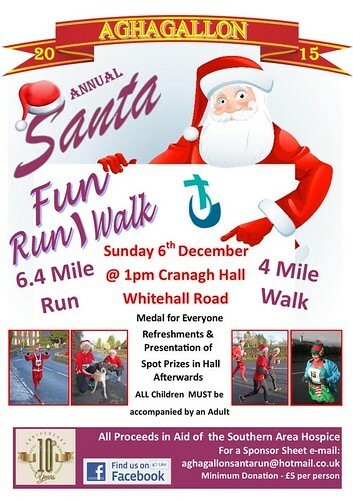 Next Sunday is the Aghagallon Santa Run which always gets a great turn-out from City Parkers. A practice run through went ahead this morning, featuring Team Kerr and the never-tiring Gillian. I'd always recommend that any runner, young or old, give something new a go, be it a new venue, distance or terrain! A wee reminder to use the Civic Centre carpark in the coming weeks. If nothing else it gets you slightly closer to Rushmere for post-run Christmas shopping. In the run up to teh festive season we'd welcome donations towards a present fund for our core volunteer team. Please throw whatever you can into the box at the scanning table. With Christmas in mind, we'll be holding a few parties throughout December (details to follow), so hoke out your Santa hats and elf jumpers while you're getting the decorations out of the roof space. There will be additional parkruns on Christmas and New Year mornings, which will get you out of the house for a relaxing hour.